When I began a grain-free diet a few years ago, I began an emotionally-dependent relationship with squash, of all varieties, that I have yet to break. And I don’t want to. Dear squash, thank you for seeing me through this grain free journey. Thank you for coming to my rescue when I needed a bread substitute. And an easy one-ingredient pizza crust. Thank you being my potato-free hash browns, for being my biscuit-free Sausage Gravy, for being my bread-free holiday stuffing, and for being my spaghetti. From butternut to kabocha to delicata to spaghetti squash, I’ve experimented with nearly every way to cook squash. This technique for cooking spaghetti squash is now the only way I bake spaghetti squash. It creates an “al dente” result with long strands of pasta. No more mushy broken strands of spaghetti squash with this easy-squeezy technique. 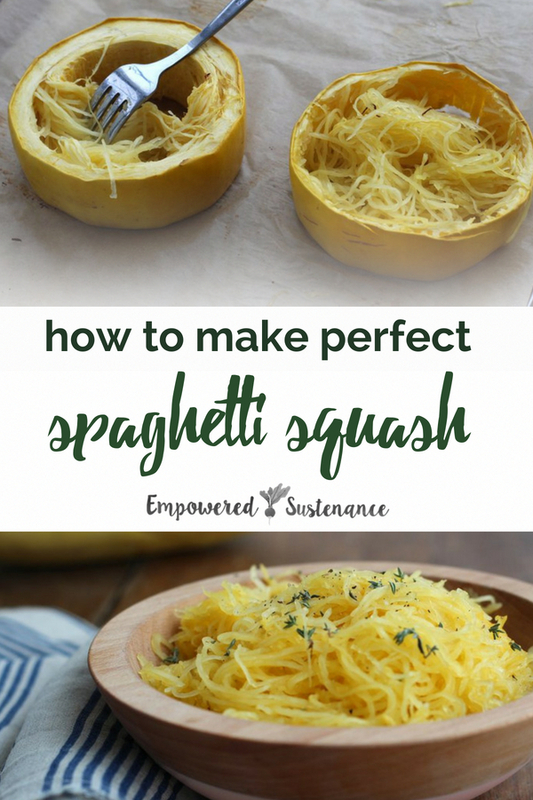 Cutting the squash in rounds allows you to create long strands of al dente spaghetti. Smallish spaghetti squashes are easier to cut for this recipe. Use due caution when cutting the squash! Slice the ends off the squash and discard. Then, cut about 1½ inch wide rounds of the squash (I make 4 cuts in a small squash) and set on a baking dish lined with unbleached parchment paper, for easy cleanup. Use a spoon to scrape out the seeds. Bake until the strands are tender but not mushy, about 50-60 minutes. 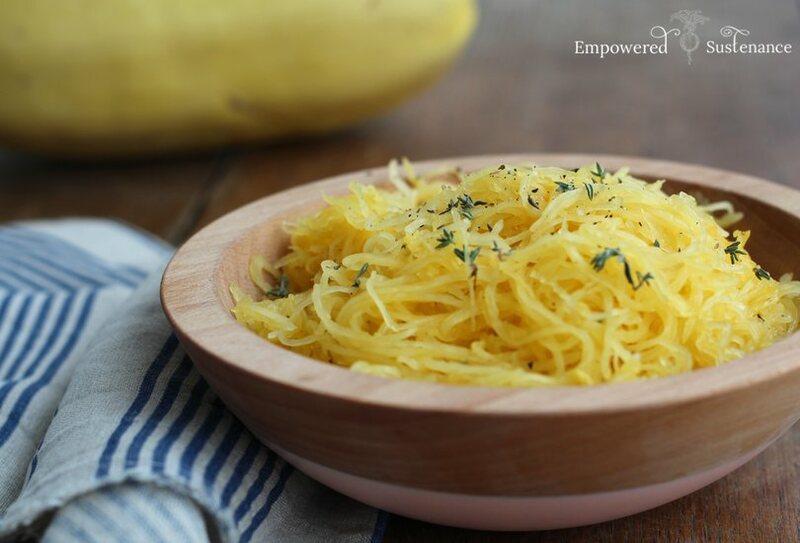 If you prefer your spaghetti squash more firm, reduce baking time to about 40 minutes. Use a fork to pull the strands into the center of each round. This creates long strands of spaghetti. I’ve now made this twice, but only had to cook for 40 min. Somewhere I read to heavily salt the rims and let sit for 10 min before cooking to help soak up extra water, and then brush off the salt before cooking. I did that and it works great! My kids have no idea that they’re eating a squash, they think it’s spaghetti (I did have to tell my 14yr old that it’s just extra skinny spaghetti because he did question it. My 11yr old thought it tasted way better than our “normal” spaghetti). I don’t think we’ll ever eat pasta spaghetti again! That is how I do it too – the salt. We love it. And, I have to admit, I was a complete skeptic when I first tried it. Good idea. Lie to your kids. JEEZ. Going to make this dish in the next upcoming days. You can put the whole squash in the microwave for about 5 minutes before you slice it, and it will be easier to cut. I’m going to see if any of my grandchildren will buy the story that it’s spaghetti. Probably not! Wow! I wish I had read this comment prior to cutting! Will definitely try this next time! Thanks! How well does it keep if I make it in advance, like the day before? You can keep this for about 5-7 days refrigerated. Just zap in the microwave to re-heat. Can you freeze it with spaghetti meat sauce? Great idea! I am cooking it this way. As for Kelly, I would not freeze spaghetti squash. It sits uncooked on my counter for months and is fine. Just wait to cook it until you are ready to eat that week. Freezing squash will turn it to mush. It keeps for 3-4 days. Thanks for sharing such a easy method to cook Spaghetti perfectly. I loved it! Hello, Lauren! I am reading your blog for the first time and really got impressed by knowing this perfect spaghetti squash baking tip. Also the video is super helpfull. Thank you so much for this lovely recipe. Thanks! For the sharing this lovely recipe.